I left very early in the morning with my youngest sister Tamam, heading to the Rafah border crossing with her to give her as much moral support as I could. Having experienced what can only be described as the torture of waiting at the border previously, I know very well how much of a nightmare going there is. Tamam returned home from Turkey after 9 months of studying Turkish Language there. About a year ago, she earned a scholarship to study for her BA in journalism in Ankara. After enjoying three weeks of her presence at home, the time had finally come for her to return to Ankara, as her summer vacation is about to end and she has to go through many procedures in order to register for the first semester of her undergraduate studies. In fact, she was scheduled to leave through Rafah border yesterday. 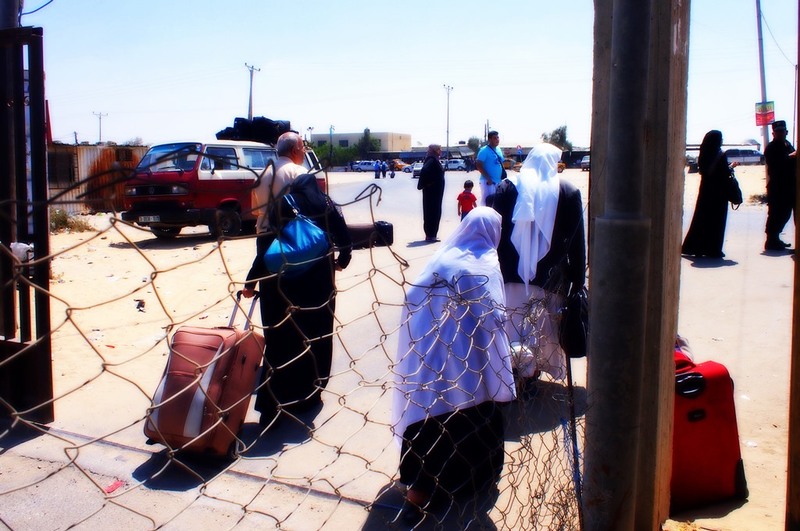 Hearing of the crowds who have been trying to cross in vain for days- if not for weeks, and the restrictions that Egypt imposed on Rafah border, led us to decide to stay at home. A few more hours of sleeping would be worth more to us than the hours we would have wasted if we had gone to the border. Yesterday the Palestinian side allowed five buses in but Egypt allowed only one. Today we decided to go, hoping that she would be fortunate enough to cross the border. As we were pulling her luggage into the car, we started laughing while mocking the dark situation we have to go through, while knowing deep inside that we will eventually have to return back home. But we insisted to go and see the situation with our own eyes. It was hard to imagine to what extent the border situation and the travelers’ crisis is getting worse, especially during the difficult times that Egypt is going through. My sister didn’t realize that a normal decision like returning home for a visit may threaten her to lose her scholarship and keep her locked inside Gaza. She didn’t know that she should have considered such a thought a thousand times before making up her mind. Such a decision is supposed to be normal in a normal situation, but not in our case, which is very far from being normal. 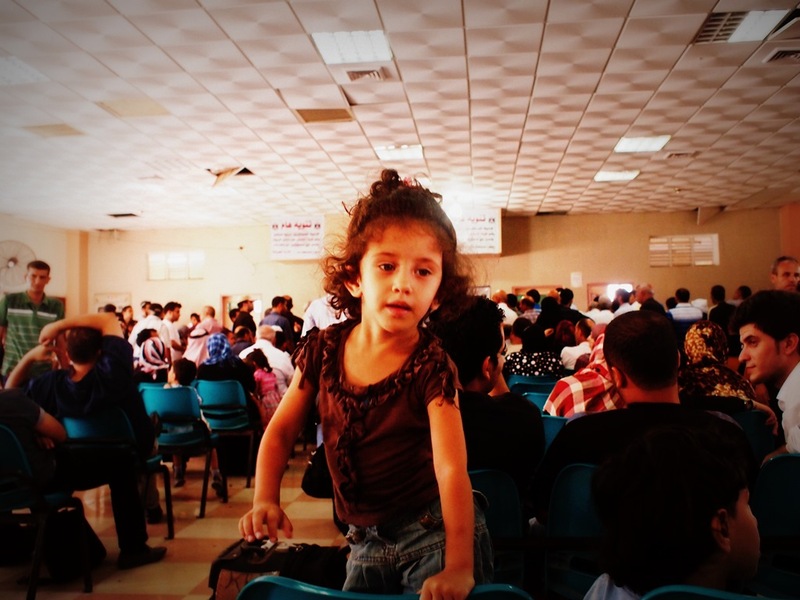 As we arrived at the hall where travelers gather in hope to hear their names called out so they can ride the bus that drives them inside the border, we were shocked to see the numerous people waiting already there. Some people had been waiting since sunrise and had been trying to cross for over a week. Most of them were students traveling for educational purposes or patients leaving for medical reasons. The scenes of the children who were lying down and sleeping on chairs and those of elderly people who could barely stand on their feet were the most heartbreaking. Elderly people were shouting at the police which was forming a fence in front of the travel coordination offices. They were powerless and had nothing to say or do, but were trying their best to keep people’s anger and frustration in control and to maintain some semblance of discipline. We were ashamed of complaining about anything, just sitting and watching people huffing and puffing. We met people who have been trying to cross for about two weeks. I expected people to rebel and break the police fence and turn the hall into chaos. But they just turned their backs, dragged their luggage and went home. I heard many saying, “at least they finally said something. At least we didn’t have to wait until sunset.” For many people this scenario has been happening for many days, so they expected the same to be repeated again and again. My sister has expressed her experience in few moving words she wrote on her Facebook page. The following is my translation of her words. My sister’s flight is scheduled to leave from Cairo to Istanbul on Thursday. 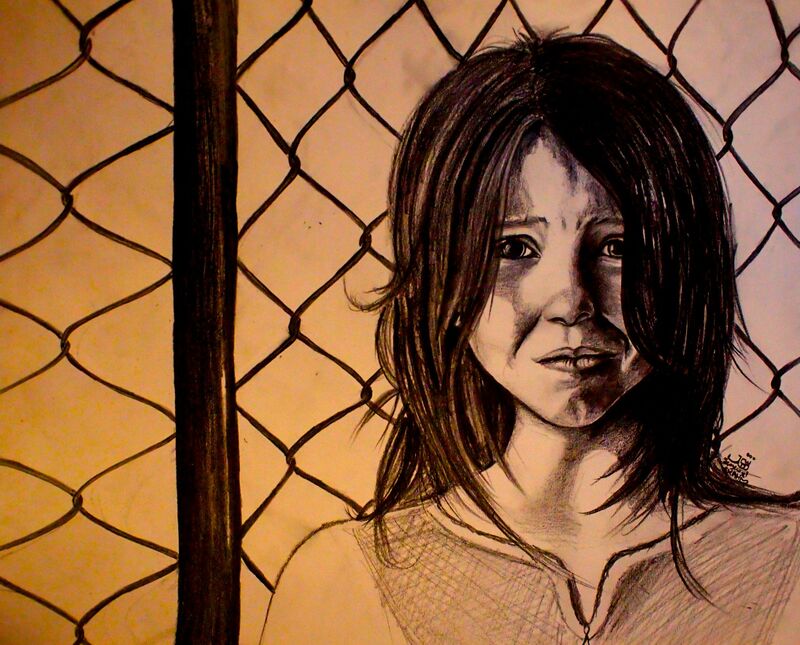 It is very likely that she will miss her flight, like many other Palestinians living in Gaza. Why should Tamam or any other traveler living in Gaza pay the price for anything happening in the neighboring countries? How many dreams are going to be crashed or how many more patients are going to die before we have a permanent and a secure way to travel? Will we ever live a normal life? This situation is utterly insane and inhumane. Collective punishment policies must end.